Before Pastor Jim Therrien, 49, moved to New Mexico, he rarely thought about environmental issues. Back in Kansas, where he was born and raised, the grass outside his home was always green, and though the state had an active oil industry, companies fenced off well sites properly and promptly cleaned up spills. But then he and his family saw the impacts of energy development on the Southwestern landscape and their new church community. Therrien began to think about the connection between the local environment and the broader issue of climate change. Every day, Therrien, a blond, ruddy and tattooed man of Irish descent, looked out his window and saw a dry land getting drier. Residents told him that winters used to be much colder and snowier. The hotter temperatures thickened the methane haze, and oil and gas traffic tore up the dirt roads. Therrien started to see these problems as injustices that conflicted with Christian values. So he decided to take a stand. Churches have long played a crucial role in social movements, from the civil rights era to immigration reform. Why not environmental activism? Therrien’s congregation, mostly Navajo, had spent years living with the San Juan Basin’s drilling boom, and the last thing they needed was a sermon about climate change. So instead of lecturing, he created a garden to reduce the church’s use of fossil fuels to transport food. Then he began fundraising for solar installations on homes around the mission and urging lawmakers to tighten regulations on methane, a powerful greenhouse gas released by oil and gas drilling. Last year, he joined the Interfaith Power & Light campaign, “a religious response to global warming” composed of churches and faith communities across the U.S. Since 2001, the network had expanded its membership from 14 congregations in California to some 20,000 in over 40 states. The group provides resources to churches and other faith communities for cutting carbon emissions — helping install solar panels, for instance, and sharing sermons on the importance of addressing climate change. Therrien says he is merely “following the Scripture.” In the process, however, he has joined a growing environmental movement that brings a religious dimension to the problem of climate change. 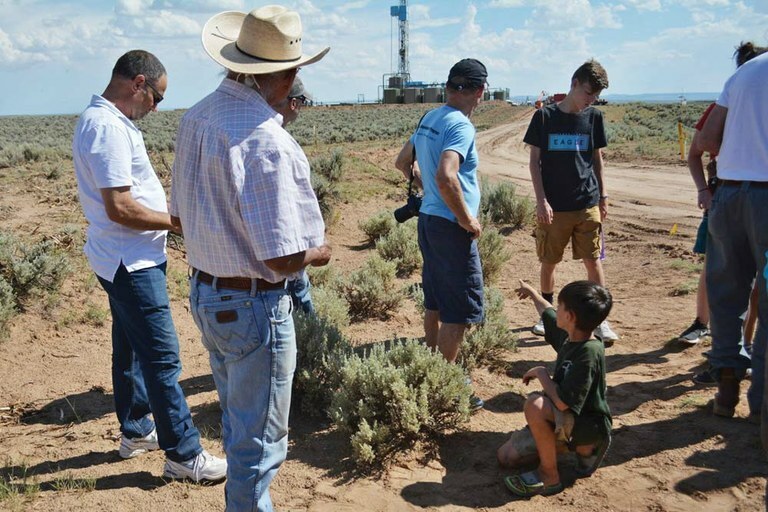 Members of the New Community Project tour the Navajo Nation near now-dry Washington Lake to learn how oil and gas extraction is affecting the Navajo people who live nearby. The green religious movement is gaining momentum. In May, nine Catholic organizations announced plans to divest from fossil fuel corporations, a move inspired by Pope Francis’ 2015 encyclical, Laudato Si’: On Care for Our Common Home. In July, the United Church of Christ delivered a similar message, urging the clergy to preach on “the moral obligation of our generation to protect God’s creation” and exhorting individuals to take political action. For these churches, climate change connects a long list of social and economic injustices they care deeply about, from food insecurity to the global refugee crisis. 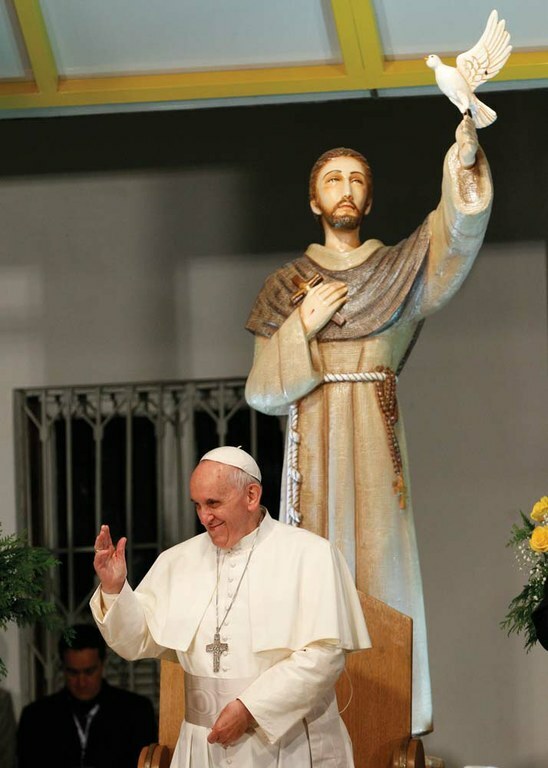 Pope Francis stands in front of a statue of St. Francis of Assisi. The pope, who takes his name from St. Francis, the patron saint of animals and ecosystems, has led a call to action on climate change for the Catholic community. “Climate change is the biggest ethical, moral and spiritual challenge of our day,” Joan Brown, the executive director of New Mexico Interfaith Power & Light, told me. She pointed to St. Francis of Assisi, the patron saint of animals and ecology, a medieval Italian monk who spent much of each year living in hermitages, caves and on mountainsides, praying in the wilderness. “St. Francis speaks of everything being connected,” she said, “of there being no separation between the human and natural world.” When Jorge Mario Bergoglio was elected pope, he chose his name in honor of St. Francis. Brown credited Pope Francis with helping reframe climate change as a moral concern. Among non-Catholics, too, the pontiff’s message has had an effect: Polling from the Yale Project on Climate Change Communication shows that the number of Americans who say they think global warming will harm the world’s poor rose from 49 to 61 percent; the percent who say the issue has become “very” or “extremely important” to them personally jumped from 19 to 26 percent. Here at his hardscrabble New Mexico parish, Therrien continues to practice what he preaches. On a hot day in July, he herded 28 visitors into the mission’s two white vans for a drive out onto the Navajo Nation. The group, mostly Easterners, ranged in age from 8 to over 60 and had traveled to the Lybrook mission as part of a weeklong fact-finding trip. Like Therrien, many were members of the Church of the Brethren, a Protestant denomination with a history of activism. More recently, their focus had shifted to environmental issues — especially climate change. “It’s concerning that our government is pulling back from what we should be focusing on,” one of them, Jim Dodd, told me. Recently, the giant Larsen Ice Shelf had broken off from Antarctica, and Dodd was worried. “Villages already at sea level are going to get flooded,” he said. Leading the group was David Radcliff, director of the New Community Project, a Vermont-based organization. “It’s a fairness issue for the rest of God’s creatures,” he told me. Radcliff has led “learning tours” around social and environmental justice issues for church groups, most recently, to the Ecuadorian Amazon. As we drove over bumpy dirt roads west of the mission, the Easterners stared in awe at the crumpled mesas and the vast New Mexican landscape. Navajo homesteads peeked out of the sagebrush. Every so often, a large semi-truck carrying pipes and other equipment roared past in a cloud of dust, heading for one of the scattered well pads or towering rigs marking fracking operations. Therrien stopped the van at one of the well sites and ushered everyone out, gesturing toward a row of high metal storage tanks. Under federal and state regulations, the company should have built fencing around it, but out here on Navajo land, Therrien noted, the rules weren’t always enforced. Last year, several oil storage tanks north of Lybrook exploded, forcing Navajo families living nearby to evacuate their homes. Since moving to the mission, he often thought about how much easier it was to ignore the consequences of oil and gas development — and of climate change — if people weren’t involved. Back in Kansas, Therrien had recycled cans and kept a compost pile, but when it came to climate change, he felt mostly resigned. “I used to think, ‘What can one person do?’ ” he told me. Now, as a pastor on the Navajo Nation, he felt a new sense of urgency and purpose. Last January, he spoke at a rally outside the Bureau of Land Management’s office in Santa Fe, New Mexico, protesting the agency’s decision to lease 844 acres of land for drilling. The rally brought together Navajo activists, environmental groups and religious leaders from the state chapter of Interfaith Power & Light. Although they failed to stop the sale, Therrien remained hopeful. “Through the church, I realized there was this network of people fighting for the same things,” he said. Therrien stopped the van at a low rise overlooking what was once Washington Lake. Families once gathered water here for themselves and their livestock. Four years ago, it dried up. Everyone piled out, while Radcliff explained how aquifers were losing water. “They’re dropping all over the world,” including in the West, he said. He paused and knelt to pick up a can that was left on the side of the road and brandished it above him. “No other creature makes trash,” he said. “So what’s progress?” The people gazed past him, staring at the dusty lakebed, where patches of dry grass swayed in the heat.